Everyone is always looking for the "next big thing," the coolest new cell phone, the most addictive new video game, or the next superstar athlete. Let me tell you something. If you're a Racer fan you can stop looking because the "next big thing" is Austen Lane. A 6-7 270 pound senior from Iola, Wisconsin, Lane was named the Preseason Football Championship Subdivision Defensive Player of the Year by Consensus Draft Services. He was also a preseason CDS First Team All-American selection and was named to the watch list for the Buchanan Award. 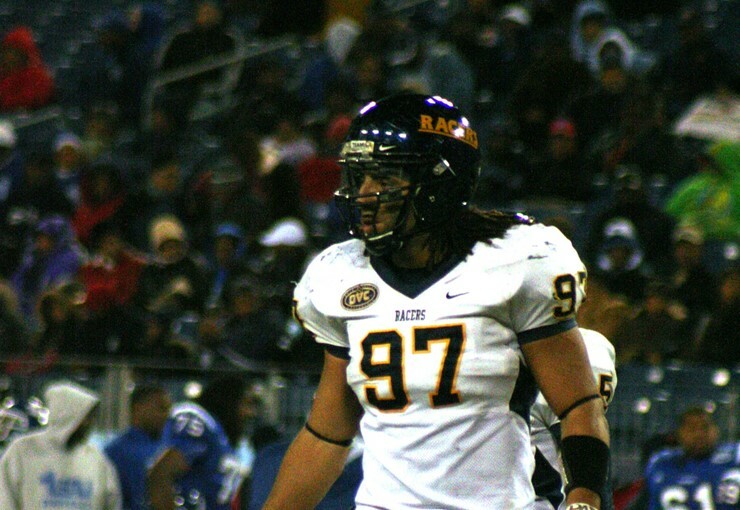 This comes after he set a school record with 12 sacks last season and ranked second in FCS with 22 tackles for loss. Following the 2008 season Lane was a first team all-Ohio Valley Conference selection, was named to the Sporting News Fabulous Fifty, and Associated Press All-American team. That's heady stuff for a kid who grew up in tiny Iola, Wisc. and dreamed of playing in the National Hockey League. "I played flag football in the first or second grade but my sport was ice hockey," Lane declared. "I played hockey for eight years starting in the second grade. I was the fastest skater on the team but I couldn't stop. I would be the first one down the ice and score a goal but I couldn't celebrate because I'd crash into the boards. "I would have had to move to play high school hockey though because Iola didn't have a team. So my hockey dream ended right there." Lane started playing tackle football when he was in the fifth grade. "I was a running back and outside linebacker," he recalled. "I loved playing running back because I enjoyed running over people and scoring touchdowns. I didn't really like defense because the defense didn't get any glory. You could sack someone but what's better than scoring a touchdown and getting your name in the paper. "I still remember the first touchdown I scored. We were the Cops and we were playing the Oddfellows. It was a sweep left and I took it 50 or 60 yards for the score. A lot of the players that I played with in youth league I also played with in high school. So we formed a bond when were very young."